A simple bound-image database sample for VB 6.0, using ADO Data Control binding. Unzip the download and open the Visual Basic project file. Run the VB project and use the ado data control's navigation buttons to scroll through the existing records. To add a record click 'New' then load an image (by clicking 'Load' to select an image file, 'Paste' to use an image from the clipboard or 'TWAIN' to acquire an image from a scanner or digital-camera). To view or update images using an Access form open the database file VBSimp.mdb using Microsoft Access (convert to your current version if necessary). Open the form 'dbpix' to view or edit the images. An ado data control is connected to the database in the 'Form_Load()' function. A DBPix image control is bound to the data control using the DataSource and DataField properties. 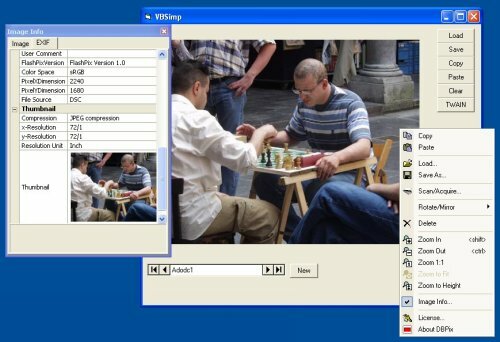 Tirival button-handlers are implemented for the carious functions; these only need to pass the call to the relevant DBPix control method - the image processing and data updating are entirely automatic. You could add thumbnail generation to this sample, storing of the image dimensions for web publishing, using external files directly or batch-loading and processing functionality. See the other DBPix samples and Technical articles for more information on these techniques.